Made of dark wood. Carved from single piece of wood engraved in gold with pattern of twined ivy on each limb. Length is 60" when strung, could fire 250yds. Mirkwood arrows are about 30" long and stained dark brown. They have long, bodkin style arrow tips. They have green flights which theoretically come from pheasant or other game birds. Made of stained wood with a coat of resin to give a nice sheen, embellished with heavy gold scrollwork at the throat. A recurve made of a single piece of light colored wood, when strung the bow is 68" long and according to the Weapons & Warfare book and could shoot 400yds with a possible draw weight of 150lbs (similar to that of Mirkwood bow). In actuality the bow was made of rubber and shot digital arrows as far as the director needed. Lorien arrows are about 40" and thinner than the Mirkwood. These have green-gold flights made of turkey feathers trimmed into a diamond shape. The shafts are dyed sage green. They have long tips in a vaguely mallorn shape, and the nocks are reinforced with bone. He has two quivers: the Mirkwood has the swirls on top, and the Lorien has the peacock design. The Lorien quiver is again made of wood but this time with a leather cover having a peacock design inlaid with gold. The mouth is fitted with a locket of gold. Holds 2 dozen arrows. The quiver stays on with a 3-point baldric harness, of which he has a different one for each quiver. At least, the buckle changes with each quiver. he has two bows that go along with the quivers: a dark one is his Lorien bow. Behind the quiver he's got two curved, bone-handled knives. The arrows change as well when he receives gifts with the fellowship. How does the strapping work? While it appears that the quiver/knife assembly is supported by a triple band arrangement across his chest, this is really movie magic, as the assembly is actually attached to a wide harness beneath the jerkin. Behind the scenes shots even show the whole quiver assembly just being lifted off/on, into place from this backboard. Why??? Because it keeps is clothing cleaner and the stuff doesn't move around or pull on his costume. Pearlescent scabbards are 24" long. The knives have a 16" steel blade engraved with brass in scrolling vine patterns and an 8" handle inlaid with the same ivory scrollwork as Elrond/Arwen's sword Hadhafang. Knives have a bronze guard & pommel fitted diagonally onto the tang. They are used for slashing and short stabbing. Etched and engraved with brass. "Each knife was honed only on the downward side and the point was sharply tapered"
More knife pictures may be see up with the quiver pictures. Dark bow is Mirkwood. Light bow is Lothlorien. From a question on "how did they get the raised designs on his Lothlorien Bow?" His bow was injection molded rubber. He shot no real arrows during the production and thus had a rubber bow for all of his dry firing. 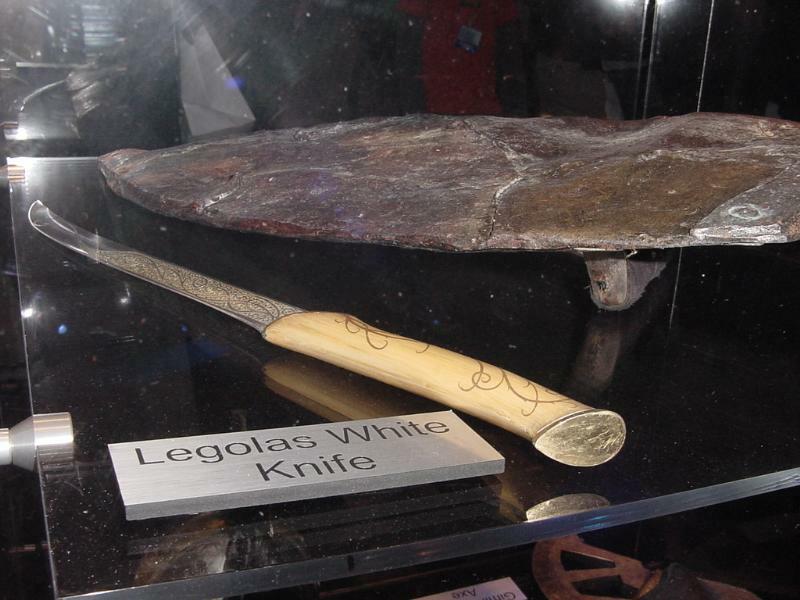 They probably made the bow with the designs sculpted on, took a mold off it and then cast it in rubber. In Lothlorien, Galadriel gives gifts to all the fellowship, chapter eight, book two, of the Fellowship of the Ring book. She gives Legolas a new bow and quiver! The way you can tell which version he's wearing in the pics is that Legolas' buckle on the chest strap changes after Lothlorien. In the first part of the movie, he is wearing the one he came with to Rivendell, from his home, in Mirkwood. This baldric buckle is shaped with delicate filigree, pointing down to his ribs. After Lothlorien, the buckle now points up towards his face and is much planer. And, if you watch his arrows, you will notice that there is a difference between pre-Lothlorien and post-Lothlorien. If you have the book the Visual Companion, from the movie, it is very deceiving, because he has been posed. He stands there in the Mirkwood chest buckle, Mirkwood bow and arrows...BUT!-he is wearing the Lothlorien cloak and leaf brooch. Here is an another drawing of that clasp again...I don't think I have it quite right...but it's a start. There may even be a third he wears - any comments? Now the quiver, pre-Lothlorien, is embellished with perhaps metal swirls. 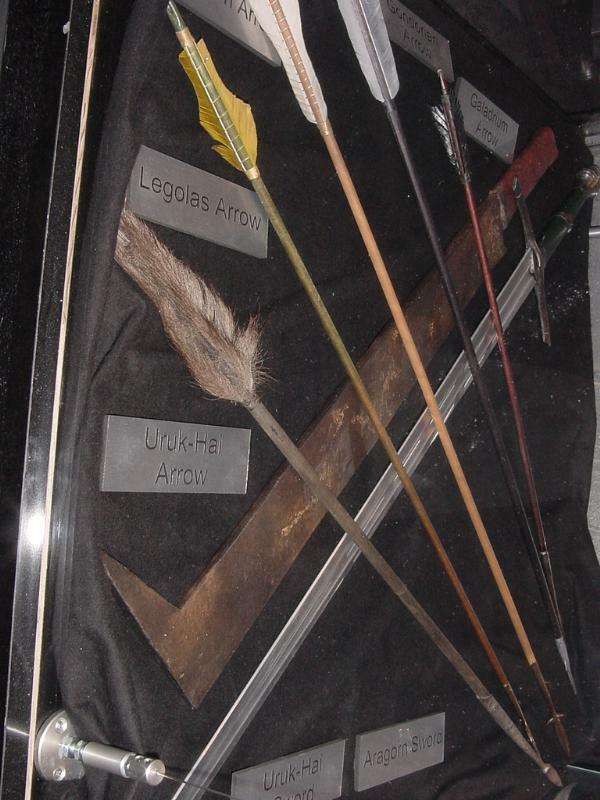 The Casa Loma pictures are not of this quiver. There is a peacock feather pattern painted/engraved/leafed on this one.-and I think it is post-Lothlorien.